Somehow, I found myself routed to the sports section via the children's section. Can't tell you how that happened! And how I found myself with a beautiful book in my hands. Dylan is someone who notices things. His mom is someone who doesn't. So try as he might, Dylan can't get his mom to listen to the man playing the violin in the subway station. But Dylan is swept away by the soaring and swooping notes that fill the air as crowds of oblivious people rush by. With the beautiful music in his head all day long, Dylan can't forget the violinist, and finally succeeds in making his mother stop and listen, too. In January 2007, world renowned violinist, Joshua Bell played his Stradivarius for 43 minutes during the morning commute at L'Enfant Plaza Station in Washington DC. It was an experiment by the Washington Post to see what would happen if one of the best violinists performed there, dressed as an ordinary street musician. Over 1000 people walked past. Seven stopped to listen for more than a minute. He made $32.17. Every time a child passed by, s/he wanted to stop - but was hurried along by an adult. • The reality behind the story is amazing: a world class musician plays exquisite music, and we are too busy to stop and listen. • At the end of the story, Dylan and his mother share in the experience of music. • The author and illustrator are both Canadian. • Kathy Stinson's (author of Red is Best) text is powerful in it's simplicity. • Dušan Petričić's illustrations of full of movement and vitality, yet ethereal. We can see the soaring notes of the music. I love how CanLit for little Canadians describes The Man with the Violin: a brilliant portrayal of the sensitivities of children and the sad loss of that wonder by most adults ... a convincing message of the capacity of music to enrich our lives and the wisdom of children that is too often and too easily disregarded. • Children are not too young to appreciate classical music. And classical music is not too outdated/old school/uncool for today's kids. Play classical music as part of an eclectic musical mix. In my classroom we listen to classical music while we eat, and sometimes when we are concentrating on "hard work" (because classical music helps our brains). A new composer each month. 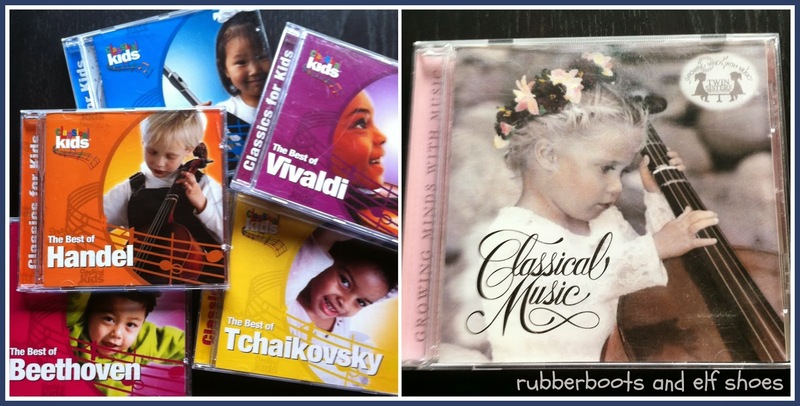 I have the Classical Kids set and Growing Minds with Music: Classical Music, and assorted other bits and pieces. • Joshua Bell's parents first noticed his musical talent when he was replicating classical pieces that he heard using elastic bands on the knobs of his dresser drawers. An elastic band guitar could substitute for drawers. Click on the picture for instructions. • Dušan Petričić's illustrations show music as colour and movement. Listen to a piece of music, allowing it to inspire colour and movement. • Check out Kathy Stinson's pinterest board for The Man with the Violin. 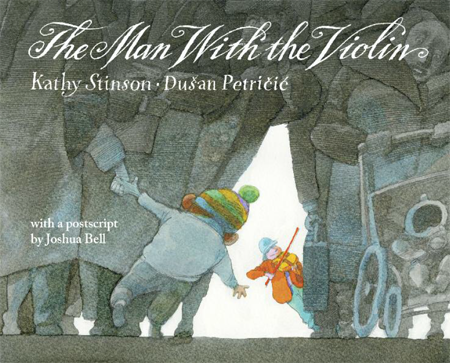 • Enjoy hearing from Kathy Stinson and Dusan Petricic in a book trailer for The Man with the Violin. Get lost in Joshua Bell's Ave Maria. And make sure you take the time to be someone who notices things. This book looks really good. Thanks for the suggestion! Oooh, I'm loving the sounds of this book, Sandi. Thanks for sharing it and all the resources. Sandi...so glad I rediscovered you via Tina's Booknificent Thursday! And so glad you reviewed this amazing book...it's one I will definitely get and read with my grandson. I love all of the activities and resources you provides....GREAT REVIEW! And thanks for the link to the Joshua Bell clip! Dušan Petričić is one of my favorite illustrators! And I love the whole story behind this! This is my kind of book. I have been thinking about writing a story about a man I've see outside the Dayton Philharmonic on concert nights playing his sax. His name is Frank and I always talk to him. I will definitely check this out this book. Great videos. I have heard the story of Joshua Bell.